If you meet the impervious cover standards, you still might get your entire plat chucked into the round file because some computer has determined that your business plan will attract automobile traffic in excess of the carrying capacity of nearby roads. Faceless bureaucracies have no respect for the inalienable right of every American to park his car on the public streets during rush hour. 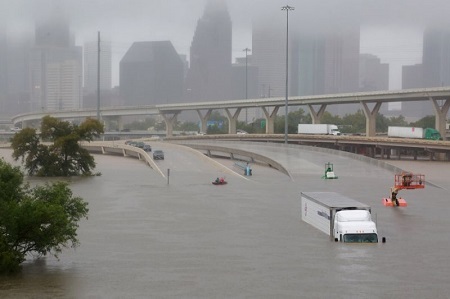 Photo: A view of downtown Houston, Texas on day 4 of Hurricane Harvey. Source: Newsweek.